Rip traveled all the way from Maryland last season just to attend one of the New 49’er surface (out of water) group mining adventures. That was his first high-banking experience ever; and needless to say, from that moment on, he was hooked. So Rip returned to Happy Camp early this season and proceeded to buy his own prospecting gear along with a used pick-up truck. He has been having a ball ever since. Rip was born in Brooklyn New York, his east coast accent sounding out when he talks. He is now retired after 22 years as a life insurance salesman. He also owned a book distribution business where he supplied a variety of books to schools. Rip’s wife, Wanda, was born in Washington State and has a unique business which rents doves for various occasions, such as weddings, funerals, graduations, and more. Rip and Wanda are planning to relocate in the Happy Camp area next year, and Rip already has some property picked out. He has fallen in love with this place in a big way, and he knows that his wife will feel the same way, once she gets here. Rip really enjoys the great outdoors, the river and the abundant wildlife. He’ll tell you himself how prospecting is keeping him young, healthy, and definitely fit. You would never guess him to be 67 years old, and he has been known to run circles around some of the 30-year-olds in the area. Rip definitely has the right approach. (well up away from the active waterway) where pay-dirt material is then fed into a suction nozzle. Since his discovery of this technique, traditional high-banking is second place. The area Rip has been working did not allow him to hold very much water up on the bank, so he devised a method of pumping water up from the river into his excavation area, and then moved his motorized pump up into the excavation so he could recirculate his own water as he worked the pay-dirt. This kept all sediments within his excavation, and the water was simply reabsorbed into the ground when he was finished each day. 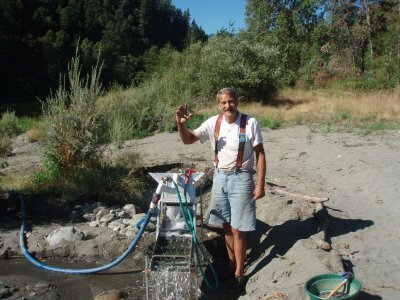 Rip tells me that everything he knows and has learned about gold prospecting is thanks to Dave Mack’s books, DVD’s, and the talks that Dave gives before all of the outings. The biggest impression has been about the absolute necessity of sampling. Rip says that this one lesson alone has saved him full seasons of wasted time and effort. Still, as Rip took the time to explain his personal mining program to me, it quickly became apparent that he has become somewhat of an expert in his own right. Dave would be the first to say that while the basic explanations are present in his material, the real key is in a person’s willingness and ability to apply him or herself to each separate situation. I found it very enlightening when Rip explained that he developed his own technique of finding gold traps along the bedrock by removing his work gloves and “looking” through the dirty water with the perception of his hands and fingers. 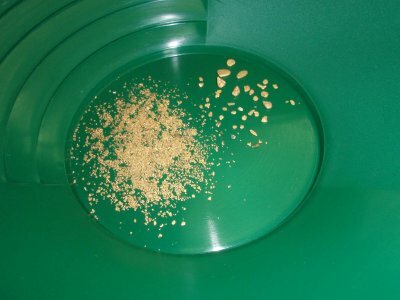 He found some of his best gold nuggets using this technique! Rip is temporarily leaving Happy Camp to get things in order for his move out west. He has become such a fixture down on K-22, and around the office, that we will all miss his smiling face while he is gone. It has been fun watching his growth as a gold prospector this year. We are happy to welcome Wanda to the New 49er family and look forward to seeing them both in the spring.